Myung-Whun Chung is well known through his numerous recordings of the works of Olivier Messiaen for DG, perhaps less so for more standard Classical and Romantic repertoire. That said his Dvorak, Brahms and Mahler performances are by no means unfamiliar, and there is a 2012 Mahler Second Symphony from DG with the Seoul Philharmonic which has to be an interesting prospect. I must have well over a dozen versions of Beethoven’s Ninth Symphony, and with no shortage of excellent recordings from the likes of Abbado, Vänskä, De Vriend and Tilson Thomas to name just a few, this live recording has something of a mountain to climb. Chung’s recording doesn’t stretch our perceptions of this grand and sometimes strange masterpiece quite in the way the latter two of those listed can. This is, however, a performance full of energy and excitement and one of which it is well worth taking note. The Seoul Philharmonic Orchestra or SPO isn’t made to make concessions to ‘historically informed’ performance in this recording. The full-fat sound of the orchestra delivers plenty of sonority while at the same time being kept agile and light through Chung’s conducting. The timpani might sound a little more like the big mattress variety on some sound systems but things are generally kept tight – this is by no means a baggy performance, with timings comparable with Vänskä though a little more expansive in the outer movements. Chung’s approach is more lyrical than overtly dramatic, and although there is plenty of contrast and urgency the calmer moments don’t make me burn with anticipation. As far as tempi go I am in agreement with Chung for the most part, though with his emphasis on the cantabile rather than the Adagio molto aspects of the third movement my instinct would be for something a little less helter-skelter. This is a legitimate reading and by no means extreme or without its moments of magic, but there is a little too much forward propulsion to allow for real repose. Rich vibrato in the strings adds texture, but these days it all depends on taste and what you’ve become accustomed to as to whether this aspect will meet with approval. I actually found it quite refreshing to hear Chung playing this in a way his orchestra clearly finds most effective. Restraint in terms of vibrato from the winds is also a bonus. 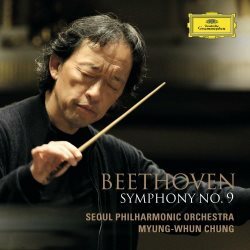 The final movement is crucial, and Chung brings out plenty of operatic drama in the extended orchestral section, building anticipation towards the vocal entries, though Beethoven’s abrupt change of direction at 6:51 sounds more like a crashed gear-change here than I recall from other versions. There is a funny drop in volume as well at around the 6:22 mark. The singers are all very good and there are no nasty surprises, though there is nothing particularly memorable either. The balance for the soloists is very much within the level of the orchestra and is thankfully very realistic rather than being over-forward. The choir is also very good, though the timps somehow become even more massive in the choral section at 9:53, nearly covering everything in a boomy blanket. Clarity is not especially fine in the tuttis with choir, and the fully massed sound comes across as a bit ‘toppy’ through my headphones, an effect dampened over speakers. The contrabassoon notes at 10:28 into this last movement are terrific, just before that Turkish march kicks in and the drama heightens once again. The classic moments are all pretty cinematic and impressive as one would hope, but this being a live recording we are given the obligatory ‘bravo’ and wild applause the instant the final notes have sounded. I admire Chung’s expressive and at times dramatic reading, but impressive though it is I didn’t feel transported into new realms. I could quite happily live with it on my desert island, and if you turn the volume up high and let everything rip this is a very good performance indeed. If you know and love Herbert von Karajan’s 1963 recording and seek something similar with deeper sound, no tape hiss, without the wobbly first oboe and the singers leaping out and shouting at you then this might be the one for you, though you probably won’t gain quite the same state of spiritual enlightenment in that slow movement. While falling just short of entering the ‘really special’ category I wouldn’t want to put anyone off from joining in on a concert which must indeed have been a tremendous experience. I will place it firmly at the ‘safe bet’ level.